With train orders, the devil is in the details, and in times of heavy traffic, the sheer quantity of details can sometimes overwhelm mere human beings. Such seems to be the case for the dispatcher who dictated the following set of orders. 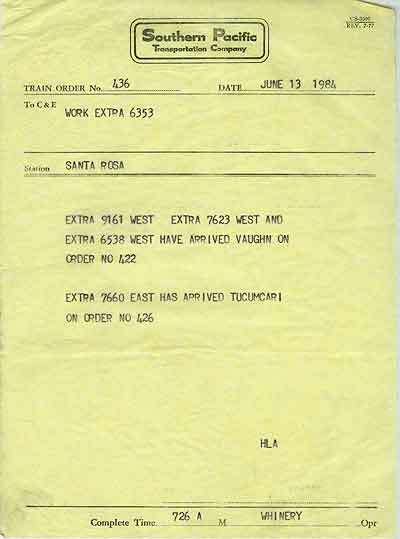 If you've read Wx4's missive on Southern Pacific's Carrizozo Subdivision, you already know that, in 1984, the line was a congested mess of a railroad, and that the train order system could not cope with the situation: too many trains, weary locomotives, extensive track work and all of the rest. 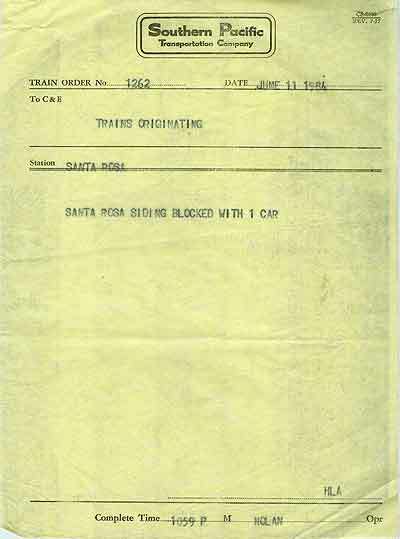 All of this seemed to have borne down upon the dispatcher this day in June, twelve days short of D (TC) Day, when movements directed by train order would come to an end. 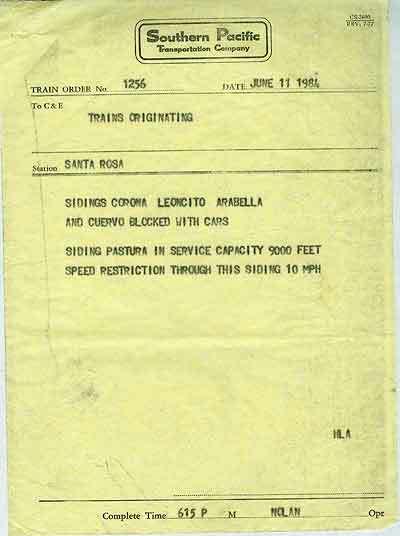 We received this smaller-than-average (for work extras, anyway) onionskin pile from the operator as we mulled over our intended work for the day: we would take the work train up to the vicinity of Newkirk and dump ties (see our Santa Rosa Work Train page). It didn't take much study of the dispatcher's directions for us to realize that something was amiss. 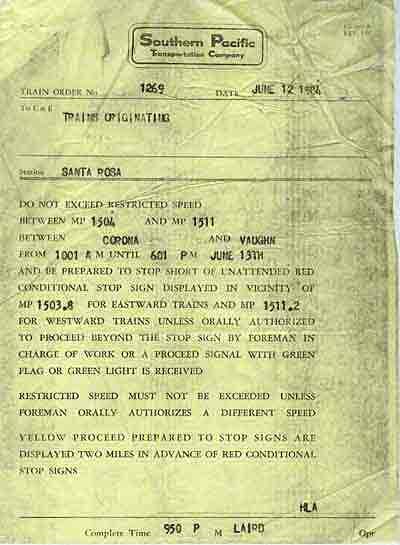 In the following, the events are history, but my thoughts about the train orders are today's contrivance, a best guess of what I was thinking at the time. 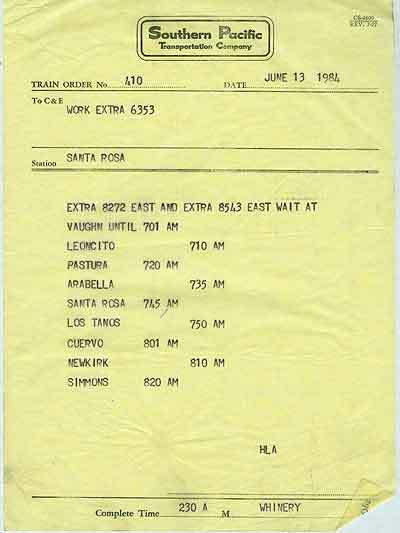 Now, if you are unfamiliar with the ins and outs of train orders, much of this may not make sense. In that case, we suggest that you begin with our Train Order Primer...if you have a couple of hours of spare time to become grounded. 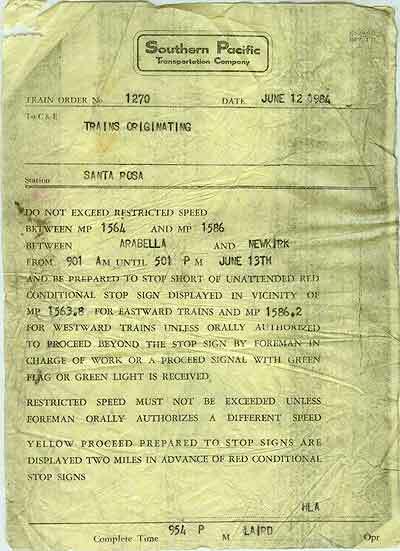 If you choose to plow ahead in ignorance, these orders still should give you a sense of the considerable skills that dispatchers, operators and operating crews needed to comprehend and implement the train order system. Further if you are familiar with present-day dispatching setups, such as DTC, TWC and CTC, you quickly realize how simple these arrangements are in comparison to movement by train orders. In terms of owning the railroad, the 6353's equity has diminished with the above two column waits. 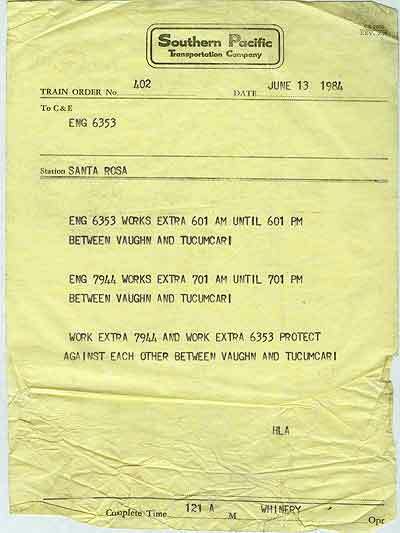 A time order is the only practical way to get an extra train into the 6353's work limits, since the 6353 could be moving in any direction at any point between Vaughn and Tucumcari. 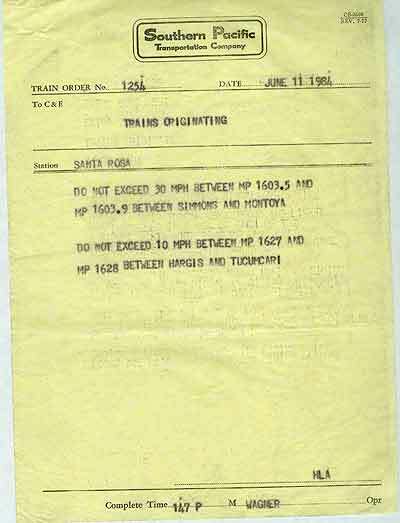 This places the onus on the 6353's crew to protect against the various extras based upon location and time. 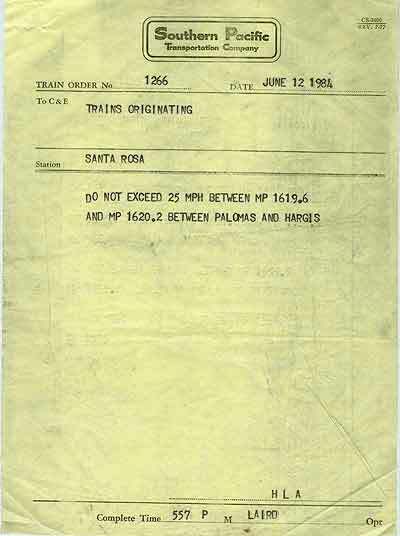 A note on time orders: a regular or extra train cannot be required to wait at a given time and place for a work extra - only other regular and extra trains. 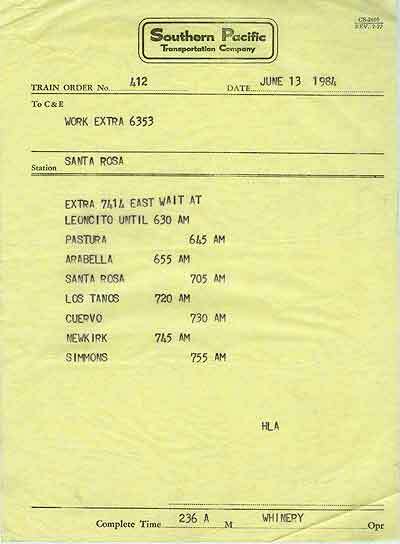 Thus, when the 6353's authority at Santa Rosa began at 701 AM, the 7414 EAST theoretically already was six minutes out of Arabella. Since the 8272 and 8543 are only 40 minutes behind the first east man, unless our 6353 is ready to head east before them (HA! ), there is only one alternative: breakfast at the Club Cafe. 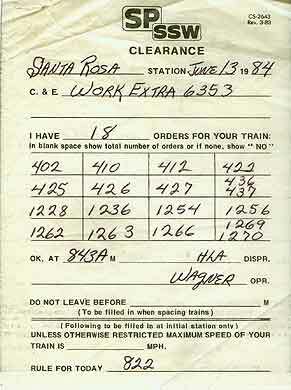 Re order 422: OK, order #436 takes care of everyone except the 7455 West - hey we've got nothing on him! Great. 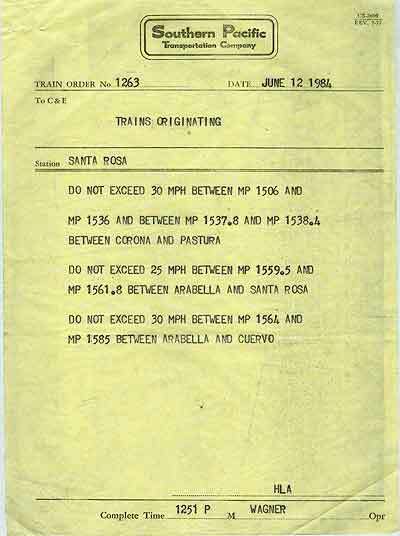 But, at least we are pretty sure that we probably will have to head back to Santa Rosa from our work at Newkirk before 325 PM, since our authority expires at 601PM, and there's no telling how many west trains will be stacked-up at Tucumcari. Now, the 6538 East (not WEST... AHA, the Vaughn Turn!) 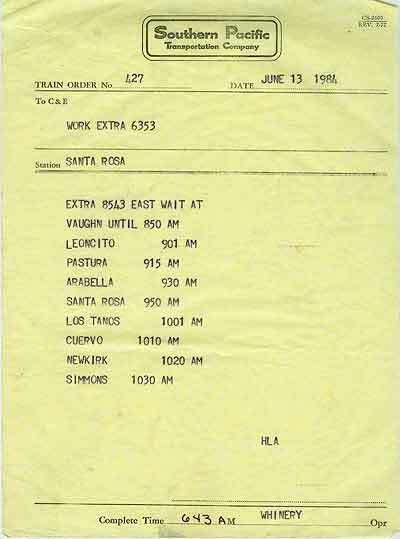 was due here at Santa Rosa eleven minutes before our authority began. Hey, Mr. telegrapher, was that the train that rumbled by a few minutes ago? 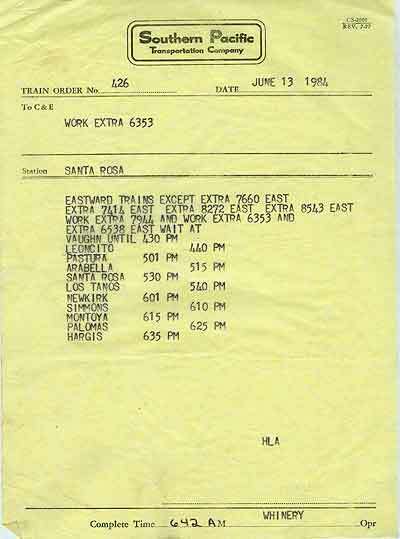 Well, that caps it, the east 'fleet' is due at Santa Rosa at 530 PM; we'd better be home and in the clear at 430, ahead of the west trains. Let's see, we need something on the 7660, 7414, 8272, 8543. The Vaughn Turn  is accounted for. Order #410 takes care of the 8272 and 8543; #412: the 7414; Where's the 7660...ah! : order 436. At least we can go westbound towards home, if we can ever go eastward towards the work. 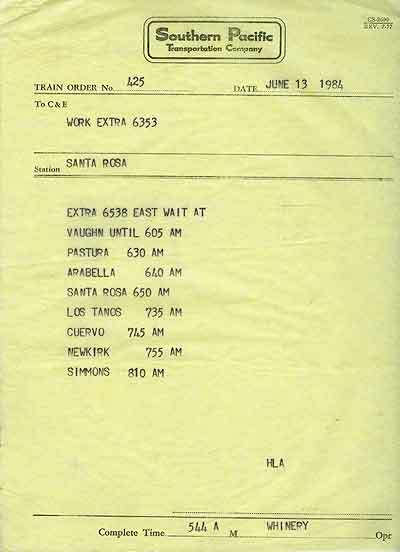 Now, order 427: Why didn't the dispatcher simply dictate an order that states, "EXTRA 8543 RUN TWO HOURS LATE ON ORDER NO 410" and avoid having the operator do all of that typing (never mind that this is an improper form of superseding order)? 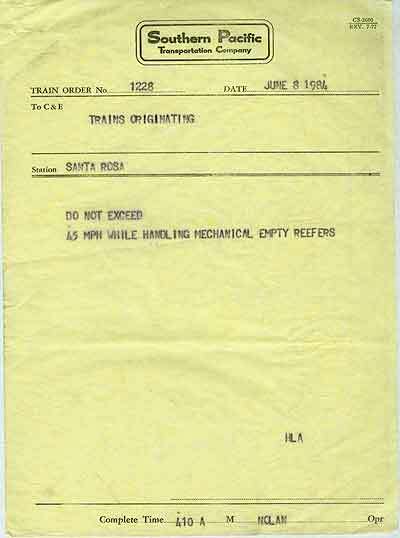 Better yet, since #427 is addressed only to us, why didn't he shitcan it entirely and have order # 437 say' "EXTRA 8543 RUN TWO HOURS AND FORTY-FIVE MINUTES LATE ON ORDER NO 410"? How many hours of seniority does this dispatcher have, anyhow? At least, after breakfast, we ought to be able to follow the 8272 East and get some work done before we have to let the 8543 go by...IF that darn dispatcher gives us something on the 7455 west. We're not going as far as Simmons, so forget 1254. That track equipment is using up all of our sidings! Thank goodness that they lengthened Pastura - we surely need more long sidings - but typical SP: 10mph. Yup, and that car ain't gonna move until somebody fixes it. OK, it's 30 m.p.h. almost all of the way to Cuervo. 1266 and 1269 don't apply, but we're inside 1270, and it's gonna be in effect before we make Newkirk, maybe before we ever make a move. Mental note: call the foreman in charge. Once we had finished wading through the orders, the conductor decided to stay behind and wait for some sort of order on the mysterious 7455 West, while the rest of us headed for the Club Cafe. Awhile later, he showed up and told us to take our time - the dispatcher had told the conductor that he would get back to him later about the 7455. 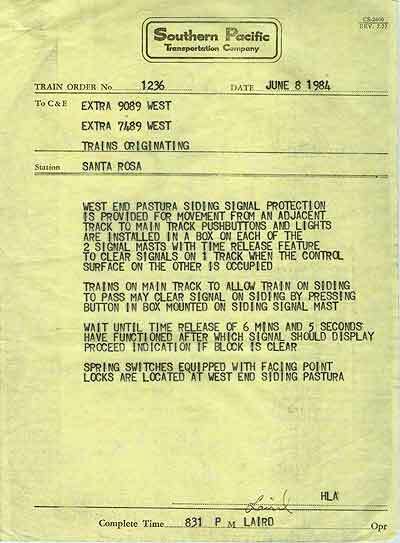 We returned hoping that we could get out on the main track well ahead of the 8272 East, but the operator still hadn't heard from the dispatcher. We waited awhile longer before the operator grew impatient and called the dispatcher, who told him, in effect, "I don't have time for this. 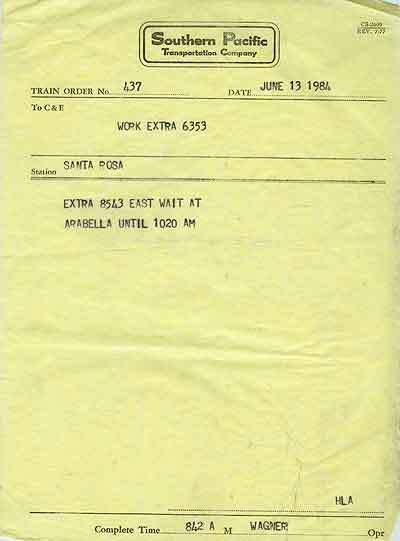 Tell the work train crew to go home." Until this writing, I had forgotten about all of this. 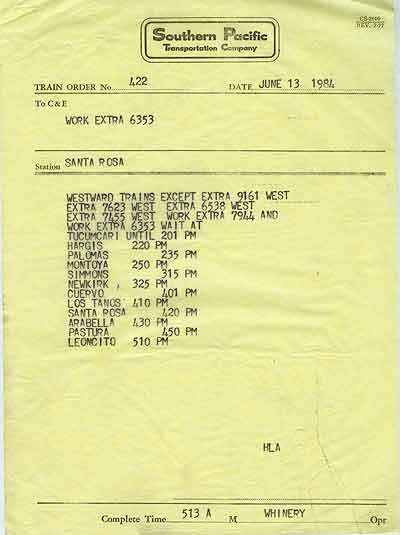 I really couldn't figure out why I had saved this particular set of orders (I kept no record of the day, except "Santa Rosa Work Train, 12 hours") until I ran across the 7455 problem. Suddenly, these orders read like a story, and long-supressed memories helped to fill in the blanks. I guess that you never really forget a rare time when you get to claim 12 hours of guaranteed pay for not turning a wheel, and then get to head for the local cantina a half-day early.